Physician-researcher Dr. Lidia Zylowska has created an 8-step program for using mindfulness practice (attention and awareness training) to overcome the symptoms of ADHD. The program includes practices such as sitting meditation, body awareness, thoughtful speaking and listening, development of self-acceptance, mindful self-coaching, cultivation of a balanced view of thoughts and emotions, and more. 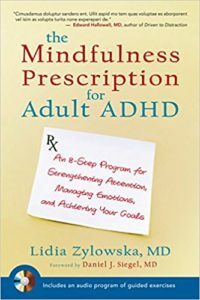 Dr. Zylowska educates readers about ADHD, helping them to understand how their ADHD brain works and how they can use mindful awareness to work with their challenges. The essence of mindfulness is intentionally bringing your attention to the present moment with openness and curiosity. Mindfulness (or mindful awareness) is the opposite of being distracted, lost in thought, or daydreaming. Mindfulness is about being alert and aware of what we are doing as we are doing it. It involves tracking our experience moment by moment to see clearly and simply what is—without being limited by automatic responses, judgments, and expectations. Mindfulness brings awareness, reflection, and choice—and is the opposite of being on autopilot. At its core, mindfulness embraces heartfulness, as it requires being kind and compassionate to yourself and your experiences. So often we end up criticizing ourselves for how we are or what we feel, and that stops us from learning from our experiences. This judgmental or hypercritical perspective can leave us stuck, ashamed, or hypersensitive. It can also lead us to pretend nothing is wrong with our behavior, when we know full well that something is amiss. Mindfulness helps us accept ourselves as we are right now and, paradoxically, through acceptance, leads to possibilities for growth and change. 1. Being nonreactive. Not automatically reacting to (that is, pushing away or hanging on to) your thoughts or feelings; instead, being able to see them calmly and with some distance. 2. Observing with awareness. Paying attention to or spontaneously noticing things such as sensations (for example, the wind on your face); qualities of things you see (colors and shapes); or observing how your thoughts, feelings, and actions interact with each other. 3. Acting with awareness. Paying full attention to what you’re doing; acknowledging what you’re doing as you’re doing it; not being absentminded or acting automatically. 4. Describing with awareness. Finding words to describe or label what you’re thinking, feeling, or experiencing. 5. Being nonjudgmental toward experience. Not criticizing yourself for what you think or feel; being open to noticing what’s going on inside of you without negative judgment. Q: I’ve heard about Transcendental Meditation (TM). What is the difference between TM and mindfulness? Attention is at the heart of all meditation practices and we can divide different meditation styles into two basic categories: (1) focused attention, or concentration training, and (2) open, or receptive, attention training. The Hindu practice of TM is an example of concentration practice. In this meditation, attention is typically focused on a single point, such as a word (mantra), or breathing. Such repeated attention to a single point trains concentration and can lead to a state of absorption or a feeling of an altered state. Mindfulness meditation (also known as Vipassana in the Buddhist context) is an example of open attention practice. While it includes some focused attention practices (for example, mindfulness of the breath), mindfulness emphasizes training in being alert and receptive to whatever happens from moment to moment. Mindfulness is a practice of awareness and remembering. You not only bring your awareness to the present moment, but you learn to pay attention to where your attention is going. When you notice your attention wandering from the task at hand, you bring your attention back to the intended task, again and again. This monitoring and remembering are called meta-awareness, and it helps you stay connected to your goals and resist distractions and diversions. Even if you get lost in the moment, with mindfulness you realize it sooner and can self-correct. Compared to the kids who ate the marshmallow right away, those who could wait did better on college entrance tests, had better career and relationship trajectories, and were less moody, less envious, and more cooperative.2 In short, they had a greater capacity for self-regulation. Strategies that relax and replenish can restore one’s reservoir of willpower and are thus helpful in ADHD. These strategies include times of relaxation such as meditation, positive emotions, self-talk that is encouraging, time of play, physical exercise, adequate breaks, or even having a snack that increases blood glucose. Motivational strategies such imagery, or physical reminders of or talking about future rewards can also help. However, as she wrote her mind started wandering off—a lot. She also felt like she was repeating herself in her writing, and her thoughts were disorganized. Since Mary has ADHD and dyslexia, writing is often a challenge, and she finds herself either hyperfocused on a single paragraph or, alternately, overwhelmed with the entire task. She started feeling bad about herself and utterly discouraged. “I’m just not a good writer!” she thought. “This is useless! I’m going to fail! I hate this!” She got up from her computer, went to the kitchen, and grabbed a chocolate bar to munch on. The food distracted her and provided some positive feeling, but she was still feeling bad inside. She decided to call a friend. As she spoke to her friend, Mary talked about her struggle with writing and how awful she felt about the whole process. Her friend sympathized with the difficulty but also encouraged her to persist. “Why don’t you write an outline first?” the friend suggested. “Then write on each section for about thirty minutes every day.” These suggestions gave Mary a new faith in herself and a new perspective. She again sat down at her desk and finally came up with an outline. She wrote her first paragraph, too, then decided to do other things for the rest of the day. She felt that thirty minutes a day was doable for her, and she decided that she could plan to work on small sections over the next several days. COMMON SELF-REGULATION STRATEGIES Ignoring, suppressing, or pushing down an uncomfortable thought or feeling Facing the unpleasant feeling Self-talk for guidance or motivation Using reminders or alarms Inhibiting a response Removing the distraction Getting away physically from a situation Eating to feel better. Drs. Kirk Brown and Richard Ryan at the University of Rochester have shown that those high in dispositional mindfulness had overall decreased levels of anxiety and depression, and they were less prone to neuroticism, rumination, and low self-esteem. They also tended to have higher emotional intelligence and positive emotions. Mindfulness also promotes a positive shift in how we relate to all of our experiences. For example, during a stressful situation, mindfulness encourages curiosity and compassion instead of shame, despair, or frustration. How you see things, how you relate to the circumstances of your life, makes a big difference in your stress level.